I’m a traditionalist when it comes to forks. We’re going to look at a few attempts to improve upon the traditional “telescopic” fork design, but none of them hold any interest to me as a thing I’d actually want to ride. Fun to look it, but I’ll stick with a Judy or a Bomber thank you. This is what was so great about mountain bikes in the late 80’s though – everyone came to the party. They brought some good ideas, and some very bad ideas, but ultimately none of them were able to overcome the telescopic fork that 99% of us ride today. Let’s have a look at these weird forks. One of the earliest attempts to improve upon the telescopic suspension fork was the ATZ add-on suspension from 1991. Our primitive North American minds were blown when we saw this Euro innovation in Mountain Bike Action. French DH rider Phillipe Perakis famously won DH races with this rather bizarre looking setup, which is just a steel hardtail with front and rear attachments that provided 2 inches of travel from elastomers. In the front, you reversed the fork, and then bolted on the ATZ unit. Same for the back, just move the brakes. If you’re an especially keen vintage bike spotter, you may think that this looks a lot like the Shockster bolt-on rear suspension. I’m not sure which of the two came first though. Amazingly, you can still purchase a Shockster for recumbent bikes. We are not going to be talking about recumbent bikes here. Nobody else tried this design, and it didn’t win any races the following year, so that really tells you all you need to know about how good it was. 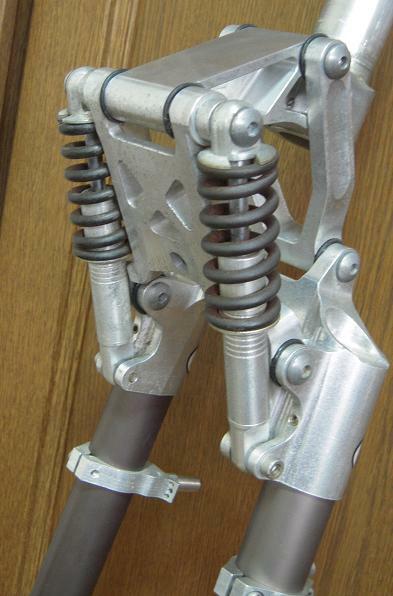 Kona’s FutureShock fork – later called Z-Link as Specialized beat them to the trademark office that day – was a similar, but designed from the ground up as a fork, rather than just bolting on to an existing fork. Like so many mountain bike things, this design was borrowed from motorcycles, Harley Davidson’s “springer” fork circa 1930 in this case. Most of the pics I see on the internet show elastomers, but the one that I rode I’m certain had a coil spring. I can’t think of any bike or bike part that I’ve experienced that was more frightening than the Z-Link fork. No matter how much pre-load you fed into it to keep it from bouncing around, it was soft. And it tracked horribly. Turn the bar, and the wheel would think about turning that way, but not until it had thought really hard about going the other way first. Bad suspension is worse than none at all. The Spencer Owyang designed Rebound fork appeared on his very well received Monolith full suspension bike. It may or may not have been available as a retail item, and is quite rare. You can find scans of mail-order shops selling them back in 1992, but that doesn’t necessarily mean you could actually buy one. I don’t know for sure how it works to be honest, but it really looks like a Cannondale Headshok, with the shock sitting out front of the headtube rather than inside it. Owyang was swallowed up by Specialized, so I don’t think there’s any question of his ability as a designer, but given that we’re not all riding versions of the Rebound here in 2017, I’m thinking it just didn’t improve on the status quo enough. Our last two forks are the two most successful weird forks from vintage times. The Girvin Vector fork debuted – I think – on the Proflex 953 in 1993. Bikepedia only goes back to 1993, so it could be earlier than this, but, good enough for the girls we go with, as they say. First time out for the Vector, it was equipped with elastomers. If you’re lucky enough to find a Vector today, and I’m not sure that lucky is the right word here, there’s a good chance the rubber bumpers have either melted, or gone rock hard. Does anyone else think it’s weird that elastomers would go either way with age? It would make sense that they either all melted, or that they all went hard, but either could happen to these primitive old things. Eventually the elastomers were replaced by a proper Noleen shock with a damper. And at the end of it’s run, by which time the Proflex became K2 and the Vector became the Noleen Crosslink, it had the very fancy Smart Shock. Which allowed you to do things with the push of a button. What things, I don’t know. Let’s say lockout though, because that’s what we supposedly always wanted. The K2 Proflex carbon with Noleen Crosslink Smart Shocks was one the ugliest bikes to ever turn a wheel on dirt. Finally we’ve reached the end of this marathon. Your reward for sticking it out right to the end is the AMP Research F-series fork. Very similar to the Proflex Vector fork in operation, the difference being that the entire linkage and shock complex sat behind the fork, under the headtube. There was a coil spring for the bouncing part with 2 inches of travel, and a tiny damper on the right side to control the bouncing. It was very light, and fairly stiff from what I recall reading, though I’ve never ridden one myself. There were a few different versions; some with steel legs (licensed to Mongoose and Univega), later ones were bonded aluminium. The final F4 version – the DH fork – had just over 3 inches of travel from a pair of coil spring damper units. Seems odd that it needed two springs, but this was probably the only way to get more travel out of it. And I imagine this was the limit of the technology, because they never went any further than 3 inches. The AMP fork was always well reviewed, but I think ultimately it couldn’t keep up with offerings from RockShox, Manitou, and Marzocchi. For me, riding the 4 inch travel Z.1 Bomber was a revelation. Whatever advantages in weight or steering precision you may have gotten from the AMP were offset by the buttery smooth action of the Marzocchi. So, they came, they saw, they failed to replace the telescopic fork in the market. I’m glad they tried though.